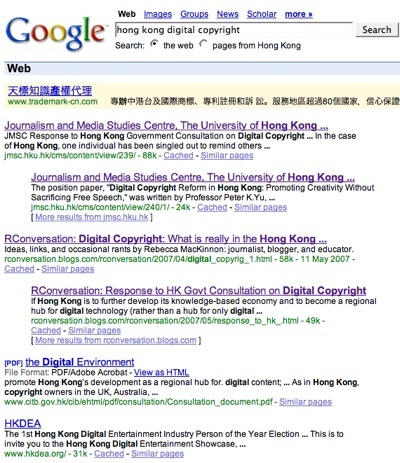 RConversation: HK Digital Copyright Update...and Peter Yu's Google juice! 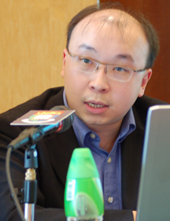 HK Digital Copyright Update...and Peter Yu's Google juice! Last week I wrote about the excellent position paper on digital copyright in Hong Kong written by Peter Yu in response to the Hong Kong government's proposed copyright reforms - many of which are ill-advised, could harm freedom of expression in Hong Kong, and don't take the interests of all Hong Kong people into full consideration. Peter has followed up with an Op-Ed in the South China Morning Post. He asks: "Should we turn into criminals the future pillars of our society? Should we slow development of internet services to protect creators of digital content? Should we sacrifice privacy, free speech and a free press in the name of copyright protection?" This is why I keep telling people: if you want to get attention on a policy issue you care about, you need to put your position papers on the web, you need to make them blogger-friendly and get bloggers linking to them, and ideally you need to be blogging about them yourself. Getting media coverage and putting articles in the newspaper is not enough, especially if those media organizations don't make their content freely available on the web. "you need to put your position papers on the web, you need to make them blogger-friendly and get bloggers linking to them,"
When you get "other bloggers" to link to them, then you are manipulating the search engine. For those who don't know, one of the ways a search engine decides if a page is relevant or not is by measuring the number of links that point to it. It is assumed that if a lot of other webpages link to a particular webpage, then that webpage must be something really useful. All is well until someone who decided that ranking high on a search engine is of very important. So he get a whole gang of his friends to link their pages to his, so that his page will score high and get ranked ahead of other searches. In other words, he manipulates the search engine to get his pages ranked high. Nothing really wrong here except that if a web site owner can have the freedom to exploit the underworkings of a search engine to his advantage to manipulate the results, then why can't a government impose laws on what sites could appear on the results of a search engine result page. Afterall, both sides are doing manipulation. At any point in time, someone out there is manipulating the search results that appear on google. Even if you live in America and google does not censor your search results, rest assured that those results that you get too are most of the time manipulated by web savvy site owners to ensure that his site gets to the top of the results page.